Dani Rodrik is the Rafiq Hariri Professor of International Political Economy at Harvard’s Kennedy School of Government. He has published widely in the areas of economic development, international economics, and political economy. His research focuses on what constitutes good economic policy and why some governments are better than others in adopting it. His most recent book is One Economics, Many Recipes: Globalization, Institutions, and Economic Growth (Princeton University Press, 2007). He often contributes opinions on trade and economics to major print media—including, most recently, an op-ed in the New York Times arguing on behalf of the guest worker program included in the recent Senate bill on immigration. This piece came about as a result of a journalist reading his blog, Unconventional Thoughts on Economic Development and Globalization. The blog, which was launched in April 2007, already enjoys an avid following. 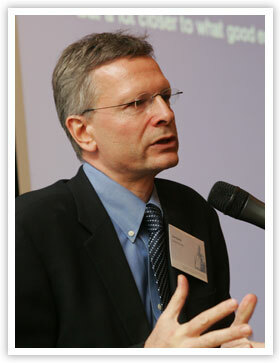 Rodrik was born and grew up in Istanbul, Turkey. He holds an AB from Harvard University and an MPA and a PhD in economics from Princeton University.